The latest Google Doodle celebrates the 40th anniversary of Ernő Rubik's puzzle, the Rubik's Cube. 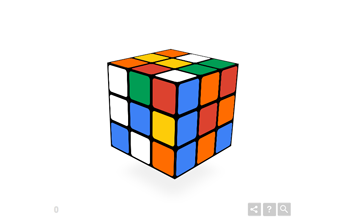 Google created an interactive animation of a Rubik's Cube on its home page. The doodle celebrates the 40th anniversary of the iconic puzzle created by Ernő Rubik. By clicking the cube and dragging it in a direction, you can twist the animated cube or rotate the whole cube. Google keeps track of how many moves you've made, so you can brag to your friends and family not only how much time it took you to solve the puzzle but also how many moves you made. Unfortunately, the controls make the puzzle a little more unwieldy than it is when the physical object is in your hands. The current record for solving a Rubik's Cube is 5.55 seconds. For puzzle enthusiasts, Google has created the Chrome Cube Lab, where people can create and play with various Rubik's Cube puzzles. Ernő Rubik invites people to try solving puzzles on the internet. "The Cube was born in 1974 as a teaching tool to help me and my students better understand space and 3D," Rubik wrote. "I can't wait to see people learn about three-dimensional objects through their browsers and to test the limits of what is possible when the Cube gets re-jigged using cutting edge web technologies. Cube on!" The various web technologies are listed on Chrome Cube Lab, including the engine that constructed the 3D cube for rendering and manipulation in browsers. How many moves does it take you to solve today's Google Doodle?